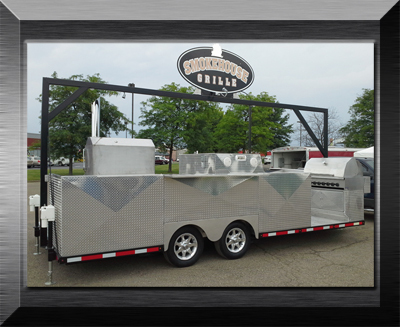 This is truly a One Of A Kind Outdoor Mobile Concession Kitchen like nothing ever seen. While this project may not be technically classed as aPrototype it certainly represents itself as a fine example of what conceptual design represents at Hoppel Fabrication Specialties. 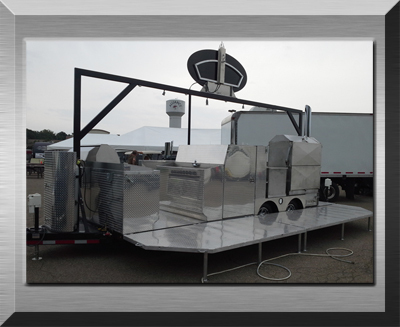 Totally customized to the specifications of our client to be fully functional in all categories of BBQ, Steaming, Smoking, Grilling and all food prep. It is constructed of diamond plate, stainless steel and steel tubing for reinforcements it is definitely an over the top design we enjoyed creating.